Lego is definitely a toy that many of us would have played with while we were growing up, and now that we are working with the ability to spend a portion of our disposable income on Lego sets that we have always hankered after, what is there to stop us from building a collection? Nothing, basically, although you might want to take a detour, so to speak, to check out other kinds of Lego-like toys like the Tegu Magnetic Wooden Blocks. Who knows? After spending some time with them, it might actually end up to be as fun as Lego. 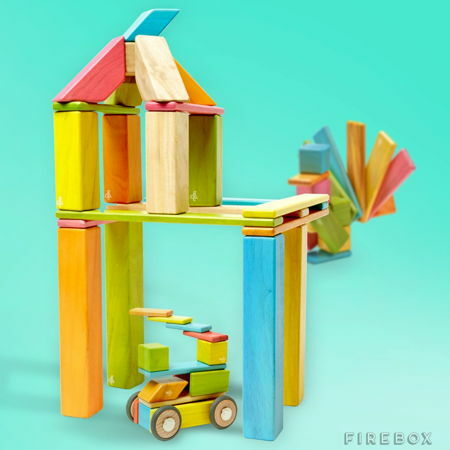 The Tegu Magnetic Wooden Blocks will arrive in a 42 piece set, a 24 piece set, and a 14 piece set that will cost £89.99, £49.99 and £29.99, respectively. They will all arrive in beautifully crafted magnetized building blocks, and perform a great job in stimulating one’s imagination – be it that of a child’s or an adult’s. You will be able to bring your creativity to a whole new level simply by crafting gravity-defying structures, where you can select from a quartet of different set sizes “for your kids”. Of course, as an adult who has spent your fair share of time with it, you might actually be inclined to never actually let your kids have a go. There are no instruction manuals to flip through, and since no electronics are involved, fret not about running out of juice. They are also naturally safe since no lead and plastic have been used in the manufacturing process, and it sports non-toxic, water-based lacquer finish without any hazardous small parts to worry about, and are made out of sustainably-sourced Central American hardwoods.